The wild rise of Bitcoin and cryptocurrencies, in general, has captured the world’s imagination. While the meteoric rise of crypto has led to fears of a bubble, it has also sparked an important debate about the applications of blockchain technology, the future of banking, and innovation in wealth management. In addition, recent news on cryptocurrency scammers and security lapses at crypto asset exchanges in Japan have led to robust conversations around regulations, cybersecurity, and implications for the future of ICOs in general. Japan’s Financial Services Agency announced recently that seven cryptocurrency exchange operators have been penalized for failing to adequately protect customers and prevent money laundering. In particular, two cryptocurrency exchanges have been ordered to stop operations for a month, following allegations that these two firms were not equipped to monitor cryptocurrency trading. Most recently, South Korea has taken the regulatory lead in announcing that by July 2018 they would have developed a regulatory framework for cryptocurrencies to be effective nationwide. As regulators, investors, and technology experts debate the future of blockchain, crypto assets, cybersecurity, as well as wealth management, we remain upbeat about what lies ahead in the crypto assets space. Blockchain technology is here to stay and a more regulated future will be better for everyone. The disruptive power of the blockchain continues to be underestimated by most financial players despite an exponential community growth. Cryptocurrencies are lagging in classification as an asset class and there are few, if any, tailored investment solutions or financial advisors available to crypto-holders. In a nutshell, the financial industry needs to reinvent itself and embrace the values of the blockchain. The blockchain industry is still in its infancy. Mass adoption is, therefore, yet to take place. If you think of market penetration now, some estimates indicate there are between three to five million cryptocurrency users, which represents 0.14 percent to 0.24 percent of the 2.1 billion people in the world between 14 and 65 who have internet access. 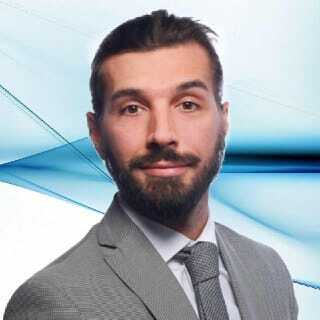 Cyrus Fazel is the Chief Executive Officer of crypto wealth management firm SwissBorg. The crypto space represents, for the moment, only 0.67 percent of assets managed by the top 400 institutional asset managers. If we compare cryptos to assets, today’s cryptos represent only 0.58 percent of the global stock markets. The huge potential is as yet untapped. Currently, professional wealth management services remain only reserved for the elite client base while the vast majority is strictly cut-off. Through robotics, automation, self-learning algorithms, and decentralization, digitalization is disrupting bank’s business models by significantly reducing costs and immensely driving market-share gains through the digital acquisition of clients. As people become more educated about ICOs and the potential of crypto assets, future ICOs that will successfully raise money will adopt new standards: companies can no longer rely on a template website and 20 pages of white paper. To attract a community and raise assets, companies will need to focus on building a business with revenues, leverage blockchain technology and philosophy through tokenization, encryption, and decentralization. To demonstrate accountability and sustainability, companies in the space will need to provide clear and adapted legal structure, accurate financials, a clear road-map and expertise in the related business. A decentralized approach with a new and trusted form of ICOs will democratize wealth management, making it accessible to everyone and not just accredited investors or wealthy funds. Top-tier investment solutions should be accessible not only to the high-net-worth individuals but to the entire world. With this ICO 2.0 model, participants have access to these benefits without needing to be accredited investors. A sustainable ecosystem that helps companies and token holders stay in the game for the long term also means companies need to focus on talent. The team should be a mix of experts in the tech and business spheres, ensuring that beyond the ICO, there are experts on the team who provide guidance for token holders on how to navigate the crypto-assets market. The future for the token market is bright but undoubtedly will be more regulated. This is a move that is welcomed by industry leaders and participants. The testament to this is the recent consolidation of two cryptocurrency industry groups in Japan, done to set-up a self-regulatory body and regain public trust in crypto after recent scams and security lapses. As the market matures, more ‘off-chain’ rules will mutate and adapt to try to mitigate and regulate the coin markets. This will happen more quickly than most people think. Authorities have the responsibility and the financial obligation to engage in and legislate this new lucrative market. Understandably, there are fears that regulation will stiﬂe innovation. Regulators will have to practice the balance between protecting vested interests and crafting rules that don’t suﬀocate innovation. The community should also start a real pedagogic approach to educating regulators and a wider audience about what is behind cryptos and what extraordinary businesses are being built on blockchain technology. Today’s economic systems are moving societies from a capitalist one to an ‘uberized’ society – a world where the King and Queen of the company would set the rules, but with platforms run by peer-to-peer services and products – and finally a ‘tokenized’ society where power and wealth are fairly distributed and accessible to all. The development of blockchain and decentralized autonomous organizations will accelerate the adoption of this ecosystem. The author, Cyrus Fazel, is the Chief Executive Officer of crypto wealth management firm SwissBorg.